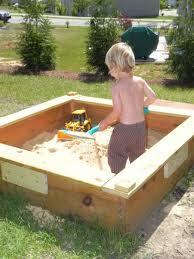 My husband made this sandbox from scrap wood at home depot. I think the wood cost us about 3 dollars! Have you SEEN the price of wooden sandboxes? WOW! These are the corner board my husband used to screw the sides of the sandbox together. He also put boards around the top for seating. 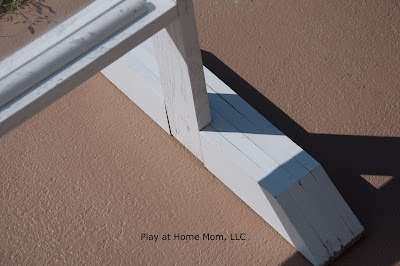 Easel - The base is a post that was cut and sanded to a shape we liked (you don't have to do that), then a notch was cut out for the 2x4 legs and frame. 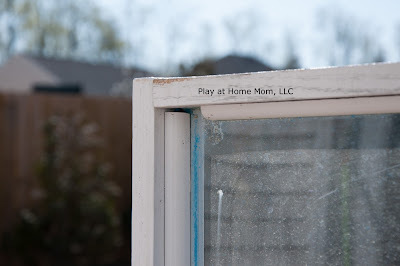 He used trim to hold the plexiglass in place. The plexiglass thickness is 1/4 inch, it's 3x3, and it's 10 inches from the ground. A closer look at the base. We cut out a notch and screwed the legs into the base. A closer look at the trim. We used the trim to keep the plexiglass in place. We nailed in the bottom and sides first while holding the plexiglass in place for a tight fit - this is a two person job. Then we put on the top wood and the trim on the top last. 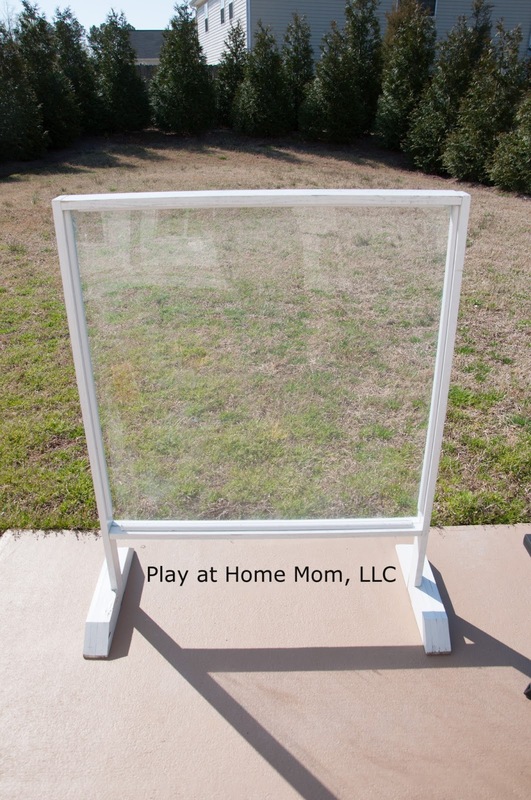 Sensory Table - top is 2'x4', legs are about 1.5' tall - but you would want to make it to fit the height of the child. The bin is a Sterilite storage container - its 22"x15". We simply place it on top as a template, traced it, then cut a hole just inside the line on the table to drop in the bin. 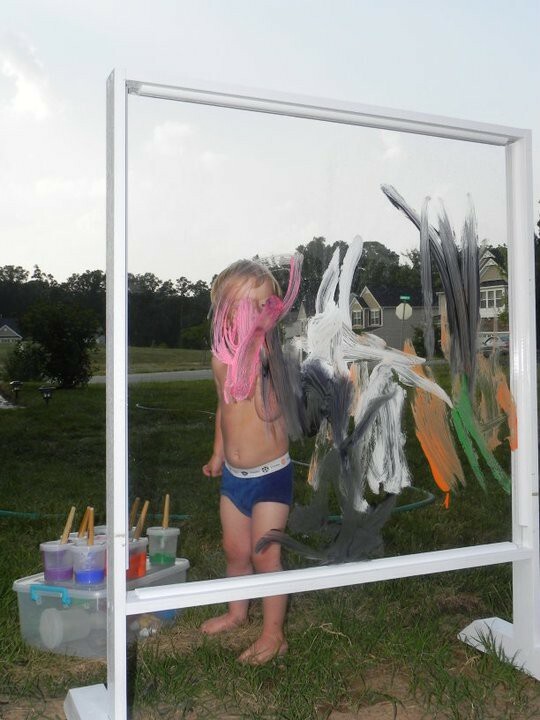 I painted it white so that when we do activities with color, the true colors show. This is the cover my husband built for our light panel. You will need plexiglass and wood. (I wish I had more specifics, but I dont. 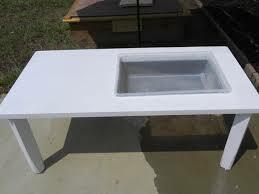 You will need to build it to the dimensions of your light table or panel. 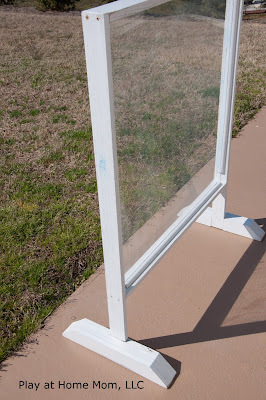 All supplies were bought from Home Depot) The plexiglass simply sits in the frame (its removable for washing). The frame has a lip on it (to discourage spills from making it to the light panel - but I always stand by with paper towels during water play, just in case). A closer look - my husband pretty much eyeballed it to get the right fit. He nailed 4 boards together for the frame, then added an edge with a thinner board, and dropped in the plexiglass. Plexiglass is removable as seen here - it just lifts out. This is the frame (he also cut out a notch for the chord - seen here). This is the light panel cover ON the light panel. Awesome! I love this! I will definitely be using some of these ideas to make things for my own kiddos! I am printing this out for my husband to see. Since he is a carpenter by trade, I think he just might be able to make me my own sensory table and window! This is wonderful. this makes me want to invest in an electric saw. the shoe organizer - was that bought like that or was it cut off an over the door organizer? can't seem to find any that aren't over the door! Did you make your light panel or was that ordered? We are going to build the light box. What kind of light or container goes under the plexiglass frame you show? I'm going to home depot tomorrow. Do I need to buy a small fluorescent lamp? Just wondering what exactly is the light panel? Is it from home depot? This light panel can be found under PRODUCTS WE LOVE on our blog - you might have to go back to "previous posts". Its under Constructive Playthings. This is brilliant! I am moving house next summer, and Ive got some money saved up to create my 2 year old's bedroom (He'll be in it from age 2&1/2 until around 7 years old) He wont be able to make a mess downstairs as we are moving into a vicarage and need it to be adult friendly and business like downstairs. Do you have any ideas or tips on creating an ideal creative bedroom for kids? Yes, I like this way to save money. I have a questions about the light box with the Christmas lights. Did you cut a hole for the cord or did you string it out under the lid. Is the sensory table also made from scrap from HD ? How much would you anticipate lumber like this costing? love. thanks! Just an FYI that a lot of the images on this page don't seem to loading. Is there any way you can repost the pictures? Thank you for sharing these instructions! We're goin' for it! One wuestion though. All is made of wood. Easel and sensory table. And you use it outside, where it rains from time to time. I live in the Netherlands, where it rains quite often. Won't the wood rotten after a while? Even when you paint it? 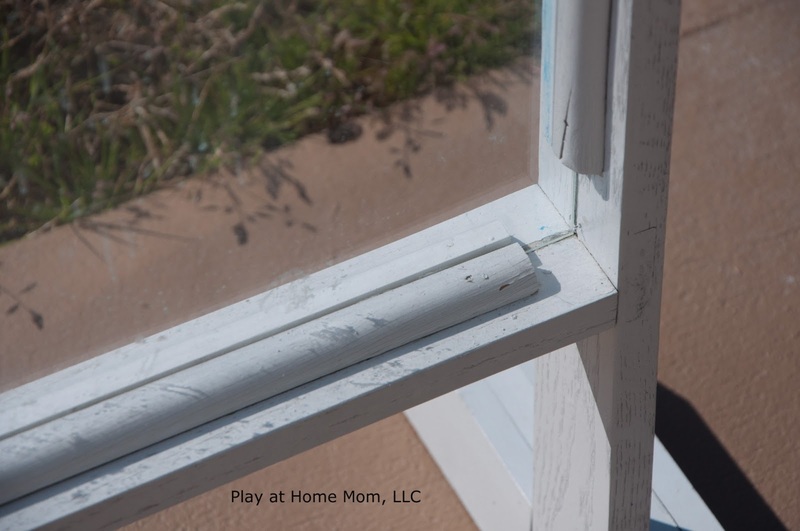 There's always nooks and cranny's that don't get paint. Or dit you kit it? An enthousiastic and faithful follower! We used oak and an outdoor spray paint....both items are kept outside at all times and they are holding up well after a few years.